Our adventure went something like this: on Saturday we raced around in (adjacent to?) the expansive Sam Houston National Forest. After spending the remainder of the day relaxing in said forest, we broke camp in the morning and loaded the bikes onto the car to drive to the city of the same namesake to race around another park named after the chap. Somewhere in between A and B, we passed up an opportunity to drive on his highway. After the race on Sunday, we even had supper with a kid named Sam. 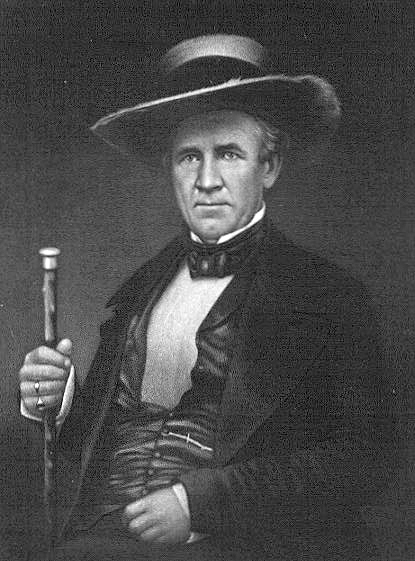 With all the homage paid to Sam Houston, you’d think he was kind of a big deal, and considering he was the first AND third president of the Republic of Texas, you’d be correct. In fact, he won the 1836 presidential election for the Republic of Texas in a landslide, taking 79.4% of the vote against another famous Texan: Stephen F. Austin, who took a measly 9.1% of the vote. The vote most likely reflected the work ethic of the two men. While Sam Houston was busy ambushing Señor Santa Anna, mid siesta, en-route to liberating Tejas from Mexican rule to create the greatest (although short-lived) Republics in the history of the world, Hipster Steve A. was most likely riding around the hill-country on his fixed gear. And in this bit of history I find a tiny snippet of delightful irony in our past weekend of racing. On a weekend where we were racing through and around the namesakes meant to pay homage to the man largely responsible for creating the State of Texas from the Mexican state of Coahuila, it was a lad from Nuevo Leon that snuck off with the victory in both P1/2 races. Both victories were perfectly executed, no doubt from the months spent planning the revenge on Sam Houston. Enrique Aldapa flew under the radar, right up until the point that he decided to blow the radar up and win the race. At Coldspring, it was at the beginning of the 5th and final lap where he bridged up to my breakaway and then promptly dropped me when I failed to accelerate uphill to get on his wheel. 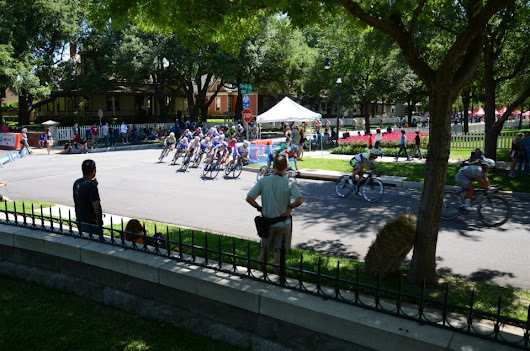 The story was the same at the Houston Grand Crit; Aldapa bridged up to, and passed, Veggie during the last lap. In both races, nobody was equipped to hold his wheel when he finally went, because he was smart and rationed his efforts during the rest of the race. As reluctant as I am to get into a car and drive east from Austin for three and a half hours into the land of Texas historic remembrance, this past weekend made me realize that I really should consider it more often. The reasons are twofold, and strangely have nothing to do with Mr. Houston: 1) the trees around Coldspring are lovely (I highly recommend camping at the Double Lake Recreation Area) and 2) …well, the trees in Coldspring are lovely. Reason two was going to be something along the lines of Houston Grand being a very well-done race, but that isn’t a reason to go back to Houston, except for possibly the once a year that Houston closes down Allen Parkway and lets us play bike-race for an afternoon. Four days ago, I wrote this, partly as a tip to get some of the 3’s and 4’s thinking about the race, but mostly to get my head around what I was going to have to do over the weekend. Putting a complex idea into words helps me to condense it into components that can be addressed one at a time. Sometimes, in the end, it looks simple. This is exactly what I spent the entirety of my race doing on Saturday, and exactly what I forgot to do on Sunday. The two days, despite being raced on the same course in very similar conditions, showed how bipolar bicycle racing can be by resulting in two radically different races. On Saturday, one team took charge and brought the race back together for a field sprint, and on Sunday, a well represented break left an unmotivated peloton to struggle for scraps. I wasn’t particularly successful in either race, but both presented situations that I could learn from. Saturday was beautiful; 85 degrees and sunny with a slight southwesterly wind. Uncharacteristically May weather in late March; the perfect day for a race. The close proximity to Austin meant that many of my teammates were able to sneak away from responsibilities for an afternoon to come race; Team Wooly Mammoth fielded a team of eight for the P/1/2, giving us the opportunity to practice racing cohesively as a team. My job was to mark the hitters and get into the break only when they went; the rest of my teammates would mark other moves to make sure we were represented in any break that got up the road. For the duration of Saturday’s race, I raced smart instead of hard. Gaubert made the early break, so the pressure was off the team; all we needed to do was follow wheels as people tried to bridge, and if one of the main players made a bridge attempt, it was my job to go with it. I surfed the front of the peloton and kept an eye on the “hitters.” When they started moving to the front, so did I. 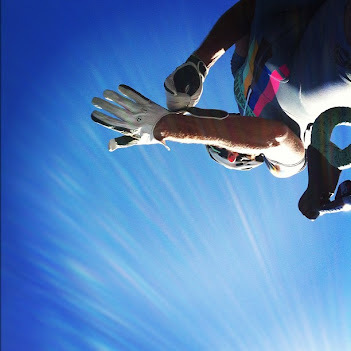 When they jumped; I jumped. My teammates did an awesome job of babysitting my impatience. When John or Chris saw me in the wind, they reminded me to stay hidden. As a result of the team’s expectations, I rode a better race; more reserved and more focused (the way I should be racing all the time). I was always aware of what was coming up on the course, and positioned myself accordingly. With each unsuccessful attempt to bridge, Super Squadra got more impatient and finally just decided to take control of the race and chase the break down. When it was clear that the race was going to a field sprint, John and I switched roles on the fly: I was protecting him for the sprint. It was a good call on his part as he took 4th on the day. We entered the race with a solid plan, and the race just decided to play out in another way. Just because our strategy didn’t manifest, doesn’t mean it was a failure. We had a man in the early break and we consistently marked and covered bridge attempts. On Saturday, we raced as a team and we raced smart; a recipe that we intended to follow on Sunday as well, although with a smaller team of four. On day two, we wanted to be aggressive and try to make the break; I was going to make sure my attacks were meaningful and effective, snappy enough that when I attacked, I wasn’t taking the entire peloton with me. When the race started, we immediately took turns covering attacks and countering when the would-be breaks were caught. We tired, but kept with the plan as attacks went off the front. What I didn’t realize at the time was that none of the big players were active; they were waiting. On our first trip up the hill at mile 5, Brant Speed and Gray Skinner blew the doors off the race and the winning break was established. 787 and Squadra were present, as were a few of the stronger unattached riders. Our overzealous execution of the plan to get into the break made us unable to go with the break when it happened. With a reduced team, efforts should have been metered, with careful attention paid to upcoming terrain and the activities of other teams. Regardless of what changed in the peloton from Saturday to Sunday, the hill was still the most significant geographic feature on the course: it deserved an equal amount of attention the second day. In the end, we had a plan and stuck to it, but it was too wide-open; we stated an objective without taking into consideration how we were going to achieve that goal. I like to time trial. I fancy myself as somewhat of a time trialist, and understandably look for any opportunity to race my time trial bike. 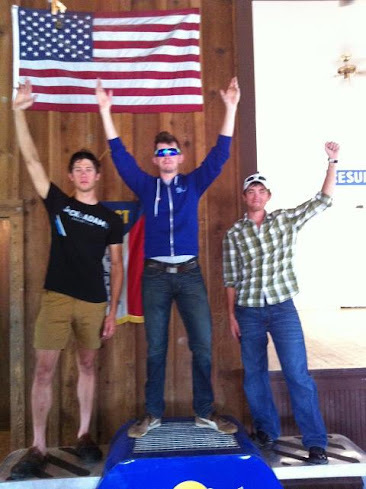 This past weekend was one such opportunity; the Fayetteville Stage Race (FSR) in Fayetteville, Texas. The FSR consists of three stages over two days. 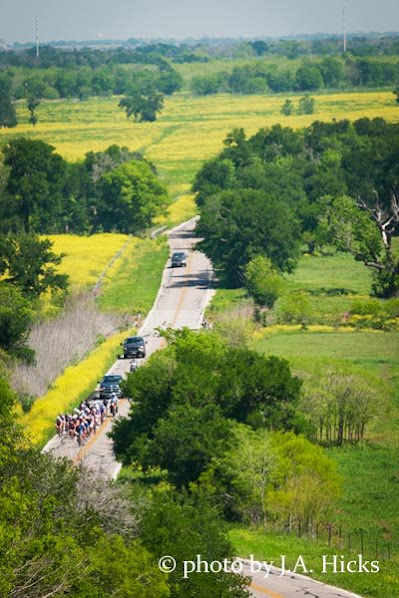 Day one, for the Cat 2’s, starts in the morning with a 68 mile road race through rolling hills in Bluebonnet country followed by a 9 mile time trial in the afternoon. The second day consists of a single stage: 95 miles over a slightly different course than the first day. General classification is based on elapsed time, so the time trial has the potential to make the race, especially in categories that don’t begin with P and end with 1. Essentially, FSR is a race that is perfectly suited to my strengths. After a solid week of training that involved crushing the Allsports Timing TT on South Mopac on Tuesday night and having a good race on Thursday at The Driveway, I knew my fitness was right where it needed to be in order to do well. Add to that, a desire to redeem myself in the eyes of my team after dragging them to Mineral Wells in a downpour in February and then not performing. To summarize: I wanted to do well in a race that suited me, with fitness that was exactly where it needed to be in order for me to win. All I needed to do was not make a mistake that would cost me time. Fantastic. No pressure, Matti. As the road race rolled from the line at 10:10 am on Saturday, a nervous electricity ran through the peloton. Attacks didn’t get chased back as much as they were doomed by too many riders thinking exactly the same thing as soon as the third person tried to bridge. One person would go up the road and then two. The third would try to bridge and the tipping point would be reached; everybody would swarm the attackers. For five laps, this was the nervous little game we played. Always on edge waiting for the next move, always hoping I was going to get a chance to get away and put time on everybody. Finally, on the last lap of the race, the Slipstream Junior Development Team decided to keep things together for the field sprint and finally took control of the race. I relaxed a little and sunk back a few rows and waited. When the pace started picking up with a few kilometers left to go in the race, I surfed wheels toward the front, taking opportunities to move up as they came. I was in good position to sprint on the right side of the peloton until a rider unpredictably shot from the centerline to the far right side of the road. I reacted and stayed upright, but lost most of my momentum. My sprint was wasted re-accelerating back to race speed as the winner crossed the line. I sat up and rolled across the line in 12th place, inside the main group and without losing time. With the road race out of the way, it was time to start agonizing over the afternoon’s time trial, which was less of a big deal. My time trial routine is pretty well set in stone, and at this point it is simply execution. I kept reminding everybody around me that it was all about pacing. “Don’t go out too hard with the tailwind or the headwind will eat your lunch.” This advice was less for everybody else than it was to remind myself. Little good it did, because I paid no heed to my own advice. The first three miles of the course begged to be railed, and I obliged. By the time I hit the 2nd turn 5 miles in, I was in the hurt locker. I slowed, made the sharp turn and then accelerated back up to speed, getting back into my tuck as soon as possible. I spent the next 4 miles concentrating on pushing as hard as possible while ignoring the fire that was building in my quads. I ended up averaging 28.0 mph over the 9 mile course. First in the Cat 2 field, and up on GC by 28 seconds. After the TT was over and the results were posted, a strange calm came over me. I was one step closer to my goal, yet all the pressure was gone. With 15 guys within a minute of me on GC, I knew how I was going to spend my Sunday, and knowing is better than not knowing. Adam and I had a plan for defending the race, and it was no use worrying about all the possible ways we could fail. We started early on Sunday. The team woke up and ate breakfast together at 5am. Oatmeal with raisins and pumpkin seeds. Orzo and sprouted mung bean omelets with sun-dried tomato pesto. We berated Jesse for drinking Folgers instant coffee. It was a relief that the serenity that had fallen over me after the results were posted had not passed in the night. I was simply enjoying being at a bike race with my boys, and the outcome of the final stage couldn’t change that. This is what bike racing should be about. Sunday’s race started the way everybody knew it would. Robert Biard attacked from the gun with a few other brave riders on the long-shot break-away. My teammate Adam Allen wasted no time and went with them. With 95 miles to race, the rest of the pack was content to let them go, and the gap grew to minutes almost immediately until PACC and Thinkfinance, both of which missed the move, sent people to the front to begin the chase. Eventually, Slipstream contributed a few chasers, but the bulk of the work and organizing was done by PACC. Thanks to Adam, I had a free ride to sit near the front of the group and watch the chasers rotate, satisfied that the time gap stopped increasing and slowly started coming down. After close to 60 miles of hard chasing, we caught the small group of escapists and the chase instantly dissolved. Not to be outdone, Biard went again and Adam just looked at me like “no worries…I got this” and jumped right back on his wheel. Everybody else just looked around confused. A break was back up the road and I had a free ride again. When the break got a minute and a half on the field, a small group of 3 bridged up to join them; there was a moment of doubt that the field would regain the motivation to chase again. I was wrong. With approximately an hour left to race, Garmin Development came to the front and, one after another, launched attacks to bridge up to the break. As long as the big teams weren’t represented in the break, they had an onus to work. Had Garmin successfully bridged, the dynamics of the race would have changed significantly and it could have been possible for the break would stay away and gain a lot of time. When nobody else in the peloton showed any interest in chasing, I resigned myself to put my nose into the wind: it was time to work. This was the scenario my coach had talked about; we knew it was coming and for the last hour of the race, I covered attack after attack from the Garmin riders. Sometimes one by one, sometimes in twos; they threw everything they could at me, and I suffered because of it. Bridge and sit, then look back to see where the next attack would come from. Staying one step ahead was critical to getting a jump on the next attacker before the gap got too large. With 5 miles to go, Joseph Garcia made a solo bid for the finish and forced the Garmins to react to salvage the possible stage win. They caught him, barely. I rode the wave to the finish for my first stage race win. The alarm started screaming at 6:30. Confused, I reached over and hit the snooze; it only felt like 5:30 and my body wanted more sleep. I dozed, but the alarm came again. The dripping of rain off the eaves and the chill draft blowing through the open window were convincing arguments for staying in bed with Emily. We discussed the possibility, but both knew it wasn’t a realistic option. The Spring Classic wasn’t going to set up itself, and I wasn’t going to leave Andrew and Holly hanging on such a beautiful Belgian day. She tried her hardest to keep me in bed, but I got the upper hand by using the vicious steamroller technique, which threw us both into fits of giggles long enough for me to escape to the kitchen to put on water for coffee. An hour later, with a belly full of breakfast, I threw on a jacket and a ridiculous yellow poncho and made my way into the elements. In spite of the soaking rain, finding myself back at the Driveway with Holland Racing was like seeing a close friend after being gone for years. It started to sink in for me exactly what Sunday’s race and time change represents for the Austin racing community: a return of the weekly camaraderie that comes with racing 85 of the same guys on a weekly basis. I’m certain that I speak for other people in the community; the most important thing about le Driveway is the ability for it to forge relationships out of an environment of adversity. Whether the bond is strengthened between a husband and wife that choose to share a hobby, between a more experienced racer and somebody searching for a mentor, or even just between a group of friend that like to share a beer on the porch after a hard night of racing; the result is a more cohesive community that builds strength and helps us all become healthier, more balanced individuals. Plus, the racing is intense. Look no further than the first race of the day for both the camaraderie and the intensity of racing at the Driveway. As the rain continued to fall at 9am, the cat 4’s took the line and started their race, and it was immediately obvious how the race was going to play out. Comanche Racing, having strength in numbers, took responsibility for making the race and immediately sent a courageous warrior off the front of the field in a bid for solo victory while the rest of the team covered bridge attempts and kept tabs on the other strong guys in the field. As somebody that enjoys being in long, painful breakaways, it broke my heart when Jordan Parker got caught not long before the finish, but it was exciting to see his teammate Devin Parker in perfect position to capitalize on the work that the field had done to bring Jordan back. Devin, who has the most awesome euro-inspired hair style in all of non-Europe, waited in ambush and dominantly took the sprint and the win; in the rain, like a Belgian. Chapeau Devin, and chapeau Comanche for racing selflessly as a team. As the day progressed and the weather got less intense while the racing action did quite the opposite. By noon, the 50 degree rain was thankfully replaced by 80 degrees of beautiful sun, giving us a respite from the wet chill while going to work drying out the race surface. The P/1/2/3 race was gearing up to be a 90-minute, first-class spectacle of high-speed tanning. And it delivered. Ninety-five racers started what would be a relentlessly fast race along the entire length of the Driveway’s Grand Prix course. Our field averaged 28.0 miles per hour and covered 42 miles over the hour and a half. John, Mike and I represented for Team Wooly Mammoth. 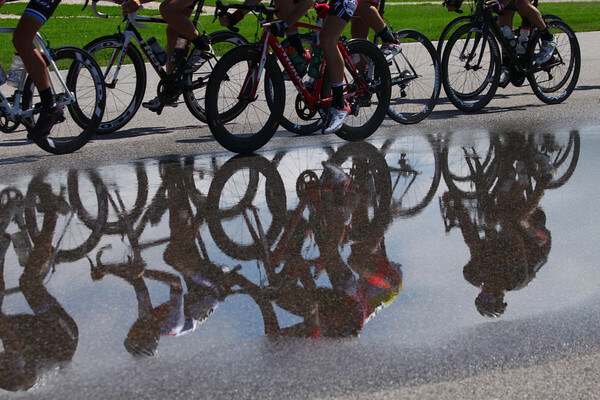 Our goal was simple; surf the front of the peloton and be present in moves as they went. The most exciting and satisfying part of the race on Sunday was getting a chance to click with a teammate while working together. With both of us near the front of the race for the majority of the 90 minutes, John and I were in position to contend for most of the day’s primes, and we took advantage of the opportunity by working on the age-old romantic tradition of cycling; the lead-out. 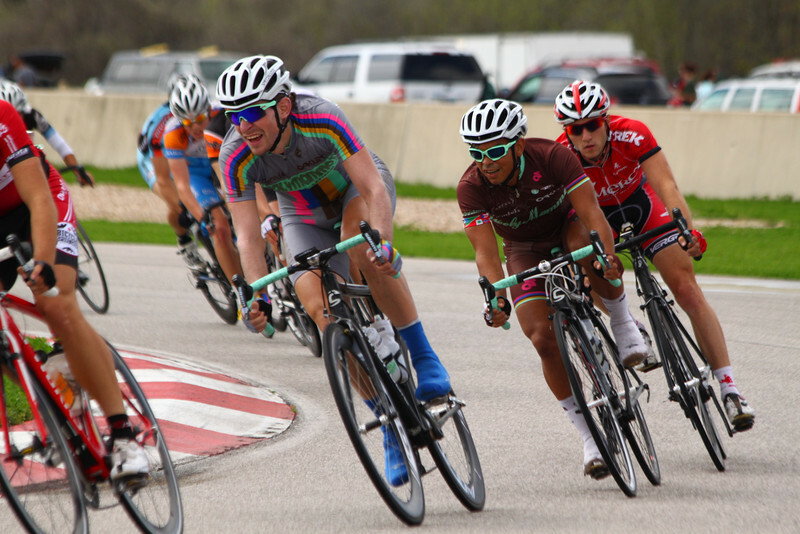 Generally, while employing a lead-out riders on a team will up the pace to string out the peloton, at the same time giving shelter to the team’s sprinter, who is strategically placed to take advantage of the faster pace in the lead-in to a sprint. 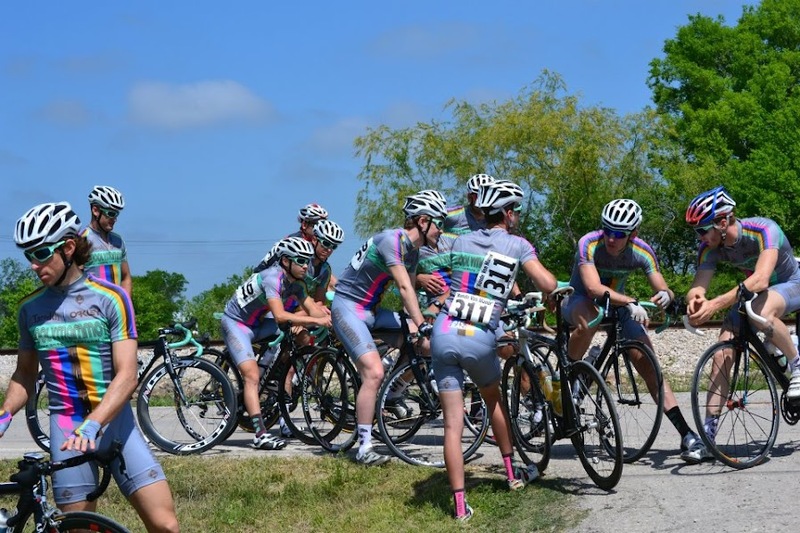 An effective lead-out requires coordination and timing, which take a tremendous amount of practice to get right. I’d like to be able to say that John and I were insanely successful and took home sack-fulls of loot, but the reality is our timing was off during both attempts, although the second was better than the first. And despite the troubles with timing, the important part is we were both there to make an attempt, and we were on the same page: as I looked back over my hip to locate John, he knew exactly what I was thinking and was willing to put in the effort to make it work. We were thinking as one with very little communication. While the energy put into those efforts could have been spent better at the end of the race, the investment now to iron out the kinks in our timing will make us much better competitors when we’re firing on all cylinders at some of the bigger crits later in the year. As the lap cards came out and started counting down the final laps of the race, the pace picked up and the position game became increasingly more difficult. My legs were beginning to feel the burn of some of the previous efforts, and the extra 30 minutes on top of what I was used to doing for a crit didn’t help matters at all. The back of the peloton was doing everything it could to displace the people at the front of the peloton, and each time up the corkscrew made the burn sink a little deeper into my muscles as I pushed harder and harder to fight off the hoards and hold my position. But every time there was a lull in the pace of the race, a few more people would find their way around the outside and jump ahead. I was drifting back through the pack, but I wanted another chance to get the lead-out right, which meant fighting harder and using every opportunity to move back up. In the end, I wasn’t able to reach John and I hit the corkscrew on the final lap in 20th. My motivation to move up from 20th was called into question as I was bumped by somebody recklessly passing on the alligator teeth to my right, and then momentum and motivation were officially vanquished when I was caught behind a crash in the last corner with 200 m to go. Yet, as disappointing as the finish was for me, the way the race played out left me with an excited optimism about the possibilities for this year. 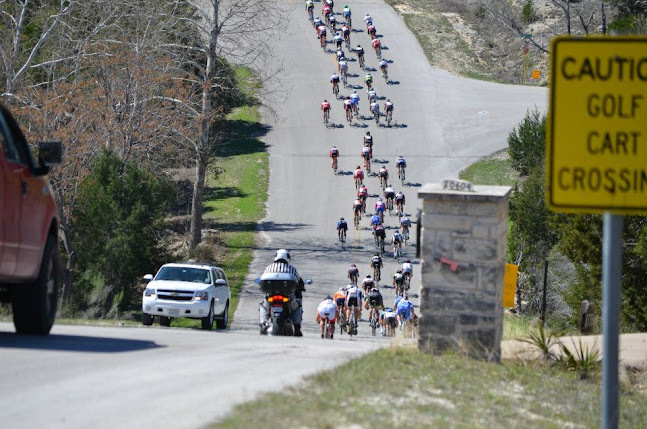 I just want to set something straight: as hilly as this course is, Lago Vista is not a “climber’s” course. No matter which way you run it, clockwise or anti-clockwise, it is not one for the climbers. 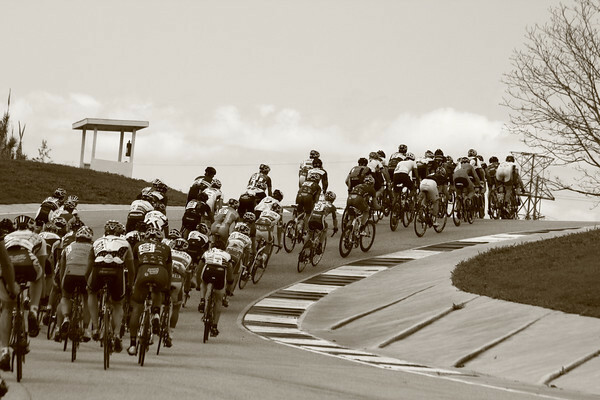 On Saturday’s course, run clockwise, the main climb is approximately one and a third mile long at a steady 2.5% grade. The reverse course, raced on Sunday, covers the same elevation, only the climbing is punctuated with steeper pitches. The 15% grade at the start of the climbing punches you in the solar plexus and the rest of the climbing laughs in your face as you gasp for breath. The steep pitches don’t crank up for long enough to separate the true climbers from the sprinters. Saturday is a day for the guys that can crank out big watts for long periods of time, and Sunday is for the explosive riders that can repeat massive efforts over and over again. With that being said, Saturday was the course better suited to my particular skill-set. The long steady drag on the backside of the course with a modest headwind set the stage for large teams to take the stage and gutter the field. With 11 riders from Elbowz in the field, it was only a matter of time before the carnage started, because when the table is set for a feast, somebody is going to eat. To survive the day, starting the climb in the top 15 of the field was critical. Every. Single. Lap. In retrospect, this is where I failed. The importance of position did not sink in until the 2nd or 3rd time up the climb, when guys started to lose it in front of me and I needed to cover gaps to stay on the main group. It became evident, although at that point I was already in survival mode. So why the trouble staying near the front of the pack, and why did it continue like that for the entire race? For me, the problem wasn’t initially the climbing or the wind; it was the descent. Every lap, the peloton would reach upwards of 80 kph (50 mph for the less Euro-inclined) on the steeper downhill sections of the course while taking the lazy sweeping turns back to the finish-line. The turns weren’t techy at all, but I still needed a few laps to get comfortable navigating the corners while in close proximity to other racers. I’d get nervous and tap the brakes in a turn that had no need for brakes and I’d lose a few positions in the pack. By the end of the descent, I was 20 to 25 guys back from where I started, ready to start climbing again in the back of the pack where I didn’t want to be. All the gaps I spent the precious energy covering on the previous lap’s climb were erased in a few misplaced lever pulls. I eventually settled down and started feeling comfortable on the descents, but by that point in the race, it was too late. I crossed the line after 83 miles in 27th place. Saturday was hard, but I knew Sunday was going to be much, much worse based on the type of efforts that were going to be involved. I had a chance to reflect on what happened on Saturday and I was determined to not let it happen again; my main focus was positioning. I spent the backside of each lap obsessively moving up through the pack to make sure I hit business end of the course in the business end of the peloton. For the first half of the race, I was extremely successful. I spent most of it in the front, but not on the front. The highlight of my day was having John Trujillo, a teammate that I respect for his ability to move through a field, comment on the way I was intuitively flowing into gaps in the peloton. And then the hills started to wear on me and I started drifting further and further back on the climbs. The first time it happened, I quickly dug deep and turned on TT mode to get back on. During the next lap, I got gapped a little bit more and worked with a small group to catch back on after the turnaround at the top of the hill. The lap after that, the gap was a little worse and the group was a little bigger, but chase we did. We chased our asses off, finally catching the main field as we prepared to pass through the start-finish. Just in time to start climbing again. That was at mile 50, and on that lap, I imploded spectacularly: my race was over. None of this is to say that I’m disappointed with the racing from this weekend, I’m simply honestly reflecting upon the weekend to identify and correct mistakes. It is easy to fall into the pattern of not being critical enough: I did poorly at Lago because I didn’t have the fitness. I’ll be the first to admit that lack of fitness played a part in my case, but to fall back on “lack of fitness” after every race is cheating yourself out of improvements that could be made. What could I have done with the fitness I had at the time? What was my potential, and why wasn’t I achieving that potential? And don’t even start with the “I’m not a climber” line. I don’t want to hear it. Every downpour begins with a solitary raindrop, and on the 17th of February, that first raindrop hit us just as the sun was setting as we merged into rush-hour traffic on Mopac, headed north to escape Austin on our way to Mineral Wells. It was like the sun was the only thing keeping the rain at bay, leaving the clouds to do as they wished as soon as the sun was enveloped by the trees on the horizon. Thick sheets of unrelenting rain; erasing the world outside the reach of the headlights. It was the kind of rain that induces an anxious, uncertainty induced terror that forces the cautious drivers on the road to slow down to 45 mph in an attempt to stay ahead of the dangers that may be hiding in the curtains of rain. A white-knuckled four hours after leaving Austin, we were unloading the car at the hotel, praying that the rain couldn’t continue into Saturday. We were wrong. The temperature dropped and the rain continued. 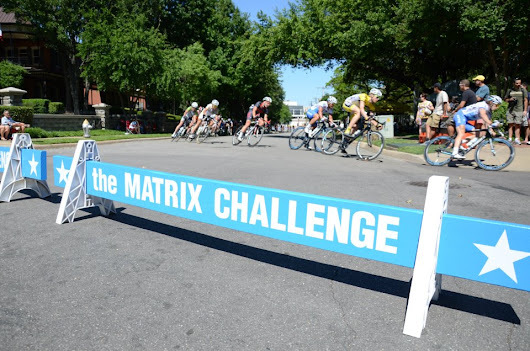 The crit was a disaster, and was a great example of how not to prepare for a bike race. Morgovnik and I made the 10 minute ride from the hotel to the course early enough to pick up numbers, but the cold, rainy weather removed any motivation we had to warm-up once numbers were pinned. As such, we started the 60 minute race with ice-cold muscles and very little motivation. It showed, as the pack split almost immediately into several groups. 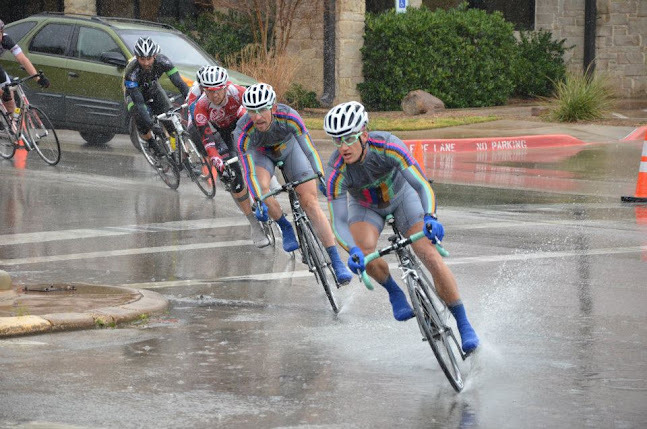 I’m only guessing at this, but I feel the guys that felt comfortable cornering a technical crit in the rain were the ones that made the initial selection. Cornering through 3 inches of water is not one of my strong suits, this I know. I ended up out of contention in one of the trailing groups on the road. When the clock hit 1:08, the holder let go of me and I jumped forward from the start house; not quite a sprint, but not a sustainable pace either. I got up to speed quickly and then tucked into the position I would stay in for the next 20 minutes. The course was hilly, but the pitches were never bad enough to need to come off the aero bars or shift out of the big ring. As my legs began to burn during the first major climb, I just counted my pedal strokes to keep a rhythm: 1-2-3-4. 1-2-3-4. The slower pace of the climbs were a welcome respite from the sharp, stinging pain of being blasted on every square inch of exposed skin; the 43 mph descents turned the soft raindrops into searing needles. Even if I didn’t question my decision to ride without arm warmers, I certainly wished I had my sunglasses on. Cresting the 2nd major hill of the course, I felt my spirits sink as the finish-line was nowhere to be seen. The long descent followed by another climb lay stretched out ahead of me. There was no visual cue to lock in on for the last few kilometers, but I was familiar with the course profile and knew the finish-line couldn’t be much further than the last climb. I stuck to my plan and rode the last climb as hard as I could; I wanted nothing left in the tank when I crossed the finish line. Mission accomplished. Had I tried to stand up to sprint at the end of the race, I would have fallen off my bike. Thankfully, a couple of guys from DNA Racing out of Oklahoma offered me a ride when they saw me make the turnaround to head home, wearing nothing but a skinsuit. Soggy and cold, we were finally done for the day. Time to relax and recover for the road race on Sunday morning. There isn’t much to say about the road race. I raced aggressively in order to take pressure off Adam Gaubert, who was sitting at 3rd overall in GC. Our goal was to put somebody into the major break-away of the day so we could put ourselves in a good position at the end of the race to counter-attack if the break got caught. 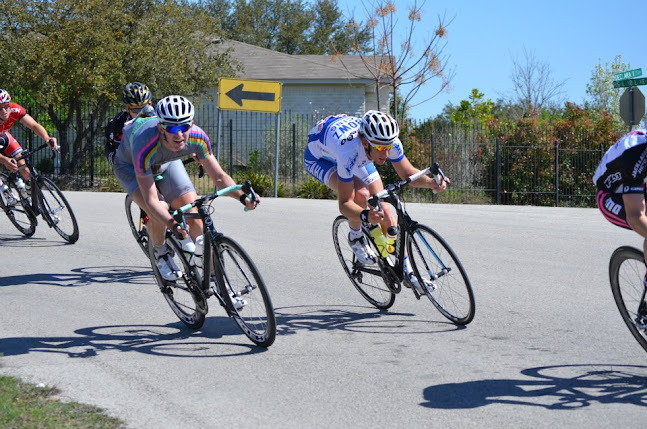 Leading into the 3rd lap, Michael Sheehan and I bridged up to a 3-man break-away that had been up the road. The five of us worked well to stay away. We almost made it, too. With approximately 2 miles to go, Gaubert rode the wheel of another rider across the gap to us and that caused the pack to start chasing. The break dug as hard as it could to stay away, but it wasn’t enough. In the end, we were caught and Gaubert’s courageous move fell short. I suppose that’s the nature of a sport where there can be only one winner. 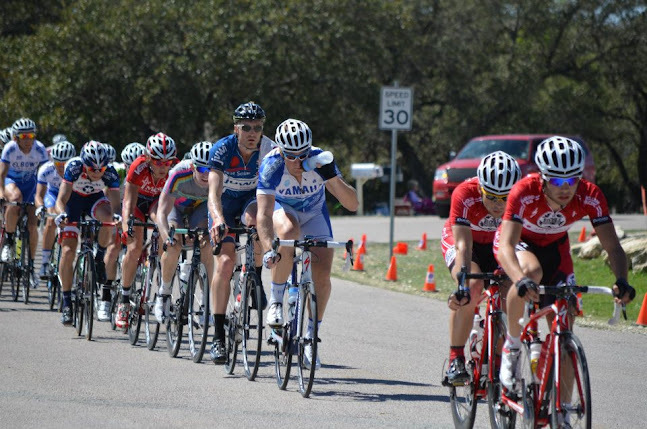 With the exception of the crit, I’m pleased with the way I raced over the weekend. The time trial shows that, while I still don’t have any top end, the engine is still there and is strong.